...that Dr. Catherine Halsey created both the SPARTAN-II program and Cortana, who was built using a clone of her own brain? The Covenant storage device, also known as the memory block, is a type of data storage module used by the Covenant. One type of memory block consists of a vaguely brick-shaped chunk of a superdense material unknown to humans as of 2552. Though humans do not fully understand the technology, they (or their AI constructs) are still capable of retrieving the data from these devices. 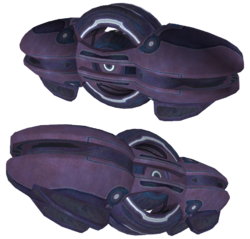 While being held captive by the Gravemind in High Charity, Cortana used a Covenant storage device to store a message aboard the Flood-controlled CCS-class battlecruiser Indulgence of Conviction headed for Earth. Based on their cursory analysis, the Sangheili forces of the Fleet of Retribution thought the storage device held Cortana herself, but after John-117 retrieved the device it turned out to only contain a recorded message. In Halo: Combat Evolved, these devices can be seen on the sides of some of the Covenant supply cases. The Covenant storage device on the damaged Flood-controlled battlecruiser.